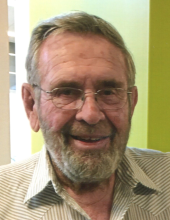 Edward Lee Lechman, 82, of Merino, CO passed away Wednesday, April 10, 2019, in Loveland after a short battle with Alzheimer’s. Visitation will be from 3 to 6 p.m. Monday, April 15, with Vigil and Rosary following at 6 p.m. at Tennant Funeral Home. Mass of Christian Burial will be at 10 a.m. Tuesday, April 16, at St. Anthony’s Catholic Church with Father Michael Bodzioch celebrating. Burial will follow at Riverside Cemetery. Ed was born July 25, 1936, in Red Lion, CO, the son of Joseph and Mary (Schiel) Lechman. He attended a little country school in Red Lions then attended St. Anthony’s School. He started driving a truck in the oil field until he was drafted into the Army on December 9, 1958 and discharged on December 8, 1960. He then returned to the oil field. On May 18, 1961, he married Dorothy Cecilia Ebbers at St. Peter’s Catholic Church in Fleming. They were married for 46 years. To this union were born four children, Joy, Craig, Charlotte, and Daniel. They built a house in Merino in 1976 where he resided until his death. He enjoyed horse riding, hunting, boating and waterskiing, snowmobiling and sharing a beer or two with family and friends. He is preceded in death by his wife Dorothy, infant son Daniel, parents, brothers Joe Lechman and Bob Lechman, and second wife Sonia Etl. Ed is survived by his children, Joy (Greg) Rinaldo, Craig (Brenda) Lechman, Charlotte (Thomas) Buford; Grandchildren Preston (Melanie) Enninga, Dylon (Brooke) Rinaldo, Danielle Rinaldo, Trevor Rinaldo, Makaya Lechman, and Joseph Buford; great-grandchildren Camden and Kinley Enninga and Brynlynn Rinaldo. Sister Dorothy (Harry) Held and sister-in-law Marge Lechman. In lieu of flowers, donations may be made to Windsong of Rock Creek Memory Care Facility, St. Anthony’s Catholic Church and the Alzheimer’s Association care of Tennant Funeral Home, PO Box 1547, Sterling, CO 80751. To send flowers or a remembrance gift to the family of Edward Lee Lechman, please visit our Tribute Store. "Email Address" would like to share the life celebration of Edward Lee Lechman. Click on the "link" to go to share a favorite memory or leave a condolence message for the family.